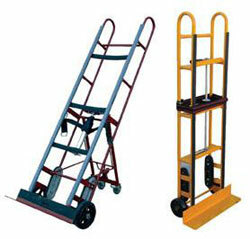 Steel Ratchet Operation Appliance Hand Truck, Dollies & Carts. These appliance dollies & carts are ideal for moving large, bulky and heavy appliances and awkward loads. A strap and tension bar is included with this unit to hold the product in place while transporting up or down stairways, hills or uneven surfaces. See table for specs (*includes (2) 3 1/2" x 1 1/2" Mold-on-Rubber rear casters). 24" x 15" x 60"
24" x 15" x 66"
24" x 15" x 72"
24" x 12" x 60"